Valued at over $2.5 billion, Eric Schmidt will sell off nearly half of his holdings in the internet search giant this year. In a filing made on Friday, Google noted that Mr. Schmidt will sell about 3.2 million shares of stock through 2013 in what has been termed as “a routine diversification of assets.” Based on Friday’s close of Google stock at $785 per share, that comes in a tad over $2.5 billion. Google’s executive chairman sold a bunch of stock during 2012 as well, raking in a little over $1 billion dollars in the process. 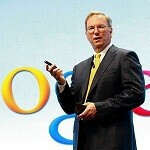 With this year’s sales, Schmidt will have reduced his holding in Google by more than half in just two years. Despite that, he will still own 1.3% of the company, and hold 5% voting power since some of his shares carry that weight. why do u think he's sellin if its a good time. the price goes down when the volume of shares selling are more and it goes up if someone is trying to invest by buyin thier shares. so apply basic logic n see ! it may be a bad sign or may be not ! I don't know why this guy is garnishing so much attention. You hardly here anything about the CEO. Have you even read the anti-competition act Wendy?? FFS..
i mean, " if you are expecting more gains from it"
Wow, those Scroogled Microsoft adds really do work. and just FYI listen to the ads again Microsoft never even denys reading your email they cleverly imply that by saying "we are different we never read your email just to sell ads" so why do they then? yes they do work. but android users just gave me thumbs down. lol. Just use what works for you and keep your bashing to yourself. To me i don't like M$ and I just don't use their paid service like xbox live gold or skype. I use free ones and i like it that way. And i support open source and open standard whenever possible as it level the playing field for great ideas and innovation instead of royalty and licensing which give me zero value.